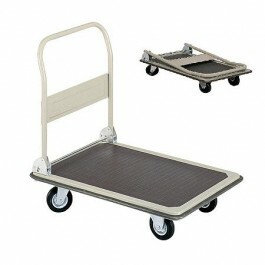 Safco Fold-Away Platform Truck - GS Direct, Inc.
Move it, fold it, store it. This truck has a heavy-duty steel construction with a vinyl wrap-around protective bumper with a non-skid vinyl surface on the platform to keep loads in place. Four large, rubber casters (two swivel). Folding handle for compact storage. Choice of two sizes. Tropic Sand powder coat finish with Dark Brown vinyl trim.